By the final four of the state tournament, he was out of the spotlight. It didn't matter. Kekoa Osorio's scintillating skills captivated mindshare in spades. 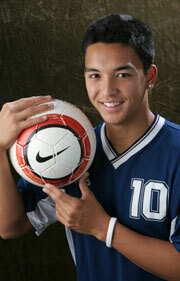 Coaches and media selected the Kamehameha senior as the Star-Bulletin boys soccer player of the year. Though the Interscholastic League of Honolulu champions were nudged out in the state tourney, coaches measured the nimble midfielder and raved endlessly. "He has composure. He's mature. He just does all the little things you're supposed to do," Kapolei coach Bryce Kaneshiro said. "He's just a very valuable player on the field." Osorio's role as a field general was a natural fit. Kamehameha went 10-1-1 in the ILH. "What separates him is he's very smart, a smooth player," Pearl City coach Tony Makue said. "His ability to know what to do is just incredible. His decision-making is one of the best I've ever seen. He makes the players around him better." Osorio, who will suit up for Southern Methodist next season, scored seven goals this season. One of the most dynamic players in Hawaii history, Osorio didn't need to score to control the tempo. "Kekoa is the best high-school midfielder I've ever seen," Warriors coach Andrew Ah New said. "He plays midfield the way it should be played. He has all the tools. He can play any position on the field. "I've never seen somebody come through with as many game-winners as he has. He's always composed, real calm, like he's watching a movie. He has outstanding concentration." Osorio amassed 28 goals in his career in his dual roles as a distributor and scorer. He also had nine assists in his career. "He played his freshman year as a forward, and the last three as a midfielder," Ah New noted. "What he did was amazing." He was joined on the All-State first team by some familiar names, including Keoki Haole of Kapolei, who is Osorio's cousin. Haole will also play at SMU next season. The high-scoring senior was named to the first team as an all-purpose player, joined by teammate Curtis Kiyabu, a midfielder. "Definitely, Curtis has a set of skills that can threaten any team offensively," Kalani coach Myles Arakawa said. "The guy that really made Kiyabu dangerous were people like Keoki. The tandem of having to watch Keoki and Kiyabu, that's the formidable part of their offense." The first-team forwards were Nick Love of Punahou, Syd Tom of Leilehua, Carter Kam of Kalani and Chance Bukoski of Kapaa. Joining Osorio and Kiyabu at midfield was Kalani sophomore Danny Higa. Punahou junior Chris Walker drew widespread kudos as the top fullback in the state. Teammate Will Jensen, Bryant Moniz of Leilehua and Vince Cachero of Iolani rounded out the list of fullbacks. Kalani goalkeeper Ian Garrod edged Pac-Five's Ian Sutherland for first-team honors. Punahou's legendary guru, Bob Clague, closed out a 32-year career with coach-of-the-year honors. After losing in a tiebreaker match against Kamehameha for the ILH title, the Buffanblu went to Maui and defeated Baldwin in a state-tourney play-in match. Punahou then edged Kealakehe and Kamehameha-Maui, routed Roosevelt and outlasted Kalani in the state championship match, 3-2. Punahou finished 13-2-1, giving their outgoing leader his 15th state crown. The first 13 titles were won between 1977 and '98. Punahou ended a drought with last year's state championship. "I'm sure a lot of guys are saying, 'It's about time he retired,' " Ah New said in jest. "He's been coaching since I played (in '75). He's coached the same way he always does, maybe a little more easy-going and relaxed. He let the boys go more." Kaneshiro, one of the top young coaches in the state, was moved by Punahou's resilience. "They were just a complete team. What surprised me the most is the fact that they never gave up. With all the hardships they had, they always found a way to pull it off. It was that will to win that they have," he said. Kalani coach Arakawa was a close second in the voting, followed by Carl Friedl of Leilehua. Ah New and Rafael Cifuentes of Makua Lani also received votes. The explosive senior scored 11 goals for the Hurricanes, who led the OIA West with 52 goals in just 10 matches. "He's got that quick burst, and he's got something different," Kamehameha coach Andrew Ah New said. "He can make that deep cut. His legs are real strong. He can be on his own 30-yard line with three guys coming and send a long ball in a tight space with accuracy." He will play at SMU next season. Love scored 10 goals as the Buffanblu went 9-1-1 in the tough ILH. "He's got a quickness about him," Kamehameha coach Andrew Ah New said. "He can stay calm when receiving the ball, has good acceleration and has a quick shot. He's very smooth." Kalani coach Myles Arakawa agreed. "Whenever he's in the game, he commands the attention of the other team. He can change the face of a game with his presence," he said. "He's just an incredible player," Pearl City coach Tony Makue said. "He's fast, quick and he's got an unbelievable leg that I haven't seen in many players in many years. I think he's a very good leader for Leilehua. They were lucky to have him. This year, he carried his team." Punahou coach Bob Clague was quickly converted into a Kam fan. "He scored the first goal on us from an acute angle. I still haven't figured out how he did that," Clague said. "You have to respect him, keep him in front of you." Kam had a team-high nine goals for the Falcons in league play. The 6-footer scored 11 goals as the Warriors won the KIF title with a 7-0-1 record. Kapaa was tough in the state tourney, though they lost Bukoski to an injury in the opening round. "It's too bad we didn't see more of him. He's got skill, size, speed and strength," Kamehameha coach Andrew Ah New said. "When you play in the Iolani system with just three defenders, you have to be a solid fullback," Kamehameha coach Andrew Ah New said. "He's been real good for a couple of years. He's strong, plays bigger than he is, plays under control. He's hard to get by." The 6-foot-1 keeper wasn't spectacular. He simply got the job done for a highly successful team. "He did his job back there," Kapolei coach Bryce Kaneshiro said. "He played solid, and that's all you ask from a keeper." Kalaheo coach John Nakagawa was quite impressed. "He came up big so many times. He was tested a lot, especially in the state championship game," Nakagawa said. "He improved every time we played them." Kiyabu scored a league-high 16 goals in 10 matches for the Hurricanes. "I think he's a workhorse. He's one of those guys who will do anything for his team," Pearl City coach Tony Makue said. "He's just one of those guys, you can tell him to do something, and he'll do it to the best of his ability. His work ethic is really, really good." "He's very good on both sides of the ball," Kalaheo coach John Nakagawa said. "He plays equally hard defensively as he does offensively. He's very, very quick. Not flat out speed, but quick with the ball. He can see things and distribute. We played Kalani three times. He was a player we had to reckon with. He's very dangerous, makes things happen very quickly. His transition game is very key." The 6-foot-2 underclassman drew wide acclaim from coaches. "He's solid back there, strong and fearless," Kamehameha coach Andrew Ah New said. "And he takes their PKs." Kalani coach Myles Arakawa agreed. "He makes the back line solid. He can absorb and attack, gain possession of the ball, and he's not just a guy who can clear the ball. He can start an attack from the back and distribute. He helps Punahou with possession, and that's so important," Arakawa said. "He's got so much skill, he's fast and he's tall." Jensen, at 6-foot-2, was rock steady in the Buffanblu backfield. "He's a composed player, smart and deliberate," Kamehameha coach Andrew Ah New said. "He's a team leader who keeps them together. Probably the best header on that team." "He was the heart of the Leilehua defense," Kapolei coach Bryce Kaneshiro said. "He doesn't make too many mistakes and he wins the ball. That's all you ask of a defender, to be a force back there. The game we beat them in the (OIA) semifinals only emphasized how important he was to them because he got hurt. That brought our confidence up because he wasn't there." Clague's 32-year run as head coach closed with another Punahou state championship. "He set the standard for a lot of high school coaches," Kapolei coach Bryce Kaneshiro said. "He made Punahou one of the soccer elites in the state no matter what year it was, exposing soccer to the islands, promoting soccer in general by putting out a great team every year." AP Keoki Haole Kapolei Sr.
F Nick Love Punahou Sr.
F Syd Tom Leilehua Sr.
F Carter Kam Kalani Sr.
F Chance Bukoski Kapaa Jr.
MF Kekoa Osorio Kamehameha Sr.
MF Curtis Kiyabu Kapolei Sr.
MF Danny Higa Kalani So. FB Chris Walker Punahou Jr.
FB Will Jensen Punahou Sr.
FB Bryant Moniz Leilehua Sr.
FB Vince Cachero Iolani Sr.
GK Ian Garrod Kalani Sr. Player of the Year Kekoa Osorio Kamehameha Sr.
Forwards: Deryck Lim, Punahou, Sr.; Kimo Komomua, Kamehameha, Jr.; Peter Jars, Makua Lani, Sr.; Brock Granger, Iolani, So. Midfielders: Alex Ho, Punahou, Sr.; Rayden Tsutsui, Moanalua, Sr.; Cody Felipe, KS-Maui, Jr.; Kody Adams, Iolani, Sr.
Fullbacks: Dylan Taschner, Kalani, Jr.; Kainoa Kahui, Kamehameha, So. ; R.J. Aglulub, Kapolei, Sr.; Dylan Eichelberger, Kalaheo, Sr.
Goalkeeper: Ian Sutherland, Pac-Five, So.